Mostly employers looking for employees, would like to have candidates with a positive attitude, confidence and dedication. They concentrate on these traits because apart from studies they do require candidates who can sustain in the job and be able to handle all the roles and responsibilities assigned, hiring entirely depends on the attitude and visions of the applicant towards the pursuing job. Personality traits are must require to well fit in the workplace environment, they like to test how one can handle a situation with his/her mental ability. Along with required skills, there are certain attributes valued by employers like personal skills and professional traits in a candidate. Here are few personality traits and qualities employers look for in a job applicant. The following are few good employees personality traits employers look for and important job skills that employers would like. With the best communication skills, one can nail the first impression at interviews. Employers will not compromise with this trait, to communicate with clients and to deliver the right message to co-worker one should have sound communication skills which employers look for . There is no use of all the qualifications and having ideas hidden with them, they must be expressive enough to make them understand. Employers interact with applicants to identify their personality, and it reveals their way of working and how to deal with people. They test to check how good they can inspire others and make people convince. The best employee is who loves the job and enthusiastic about his/her projects or assignments. The excitement to take up the responsibility is what impresses the employers. They target the candidates with this quality. The person who always tries to explore something new can plate up his talents and offer to welcome the new responsibilities which is very much necessary for the growth of the organization. This energy levels will drive the candidate to learn and update their skills in order to develop the organization and resolve the crisis situation. A person with this trait will enhance others and stand up as inspiration. To get hired into any organization spontaneity is also one of the important criteria. People with a sharp mind can handle stressful situations and get a solution to the problem within in no time. These type of personality traits will help for problem-solving. The presence of mind is much important in a workplace environment, they do get a chance to face a new issue in work and spontaneity is what required to solve the problem. Employers mostly hire these candidates, since it will benefit the organization. Employers may throw some situations and ask the candidate to react to the situation or can ask for his/her point of view on it. It is also one of the essential quality required to acquire a job. A charismatic leader will unite their peers to drive for the success of the common goal. They give a chance to others to understand their ideas and opinions. They learn from others and also teach others, they pave the way to their team to walk on a successful path. They appreciate others and cheer them up. Improve your Motivation as it is required to gain something. They are much transparent and will guide others to follow the policies or rules. A person with this personality trait is apt for any kind of job. That is why they get hired most. Employers would be happy to hire candidates who are flexible enough to accept the process changes or upcoming norms. It makes them feel valuable employees hire. It also assures the employer that they can take up any opportunity irrespective of their concerns. It also ensures that can be part of the diverse culture. Personal traits are more with handling work and dealing with people, so this is also one of the traits that are being examined in the interview. It is necessary to adapt changes in corporate culture, and the business scenario will keep changing and the employers also should be ready to take it up. The basic expectation from a candidate is discipline. A person with indiscipline senses that, he/she does not adhere to the company rules and regulations. In other words, not being responsible at the workplace. Since it is the very first basic quality for a professional they will not ignore this personal trait. People with this quality are self-organized, and employers do not have to spend the time to maintain it. To be successful and achieve goals employees should be well disciplined. Certain rules are laid by the organization, so that every individual follows it, violating them leads to bad work culture. Organization requires a strong team. To build such a team it should consist the best team players. To achieve goals all the teams should contribute the best performance. They should collaboratively work for success. An optimistic person always looks for the best and aspires for the best to happen. They are much confident and positive towards the task assigned. They also accept the failures and motivate themselves to work hard for future assignments. They accept feedback and try to work on it, rather than opposing of what others suggested. They hire candidates so that they render their services for the organization on a long-term basis. They expect the employees to be loyal to them. They look for a candidate who works honestly for the employers. If they try to cheat or back-stab the company it affects the reputation of the company. They aspire for the candidates who works for the organization and present it as best to other competitors. One culprit is enough to ruin the others and cause damage to the company, so they check the background of the candidates while hiring. Being tech savvy will be an advantage to get hired. These days organizations face heavy competition and recession. So they require candidates who can bring innovative ideas or develop products or services which help for the organization to grow vertically. They can also train others to work for the common goal. They always try something new and keep inventing things to increase the sales of their products or services. They explore how other competitors are doing and how can they stand equal to compete them. So employers identify them as important assets of the company and hire them. An efficient person always checks for the accuracy . They always strive to get best results, quality of the work delivers the best quality services. Quality plays an important role in attracting clients and customers. No organization wants to do rework or waste time on reproducing something, its waste of time and money. They wanted to deliver quality products in their first attempt. So a person who aspires for perfection would probably be required by the employers, this personal trait helps to get a job. Minimal errors lead to good productive results. It is one of the professional behavior a perfectionist possess. Right from resume writing to presenting skills to the interviewer one should be well organized, which will help them to grab job. They love to hire such candidates. Since there is no one to teach at workplace how to organize their work or perform tasks. If a person assigned a task, they will only train the employee how to solve it, but they will not teach in what style they do step by step procedure. Right from beginning to end, they have to be self-organized to resolve the task. One should have their own skills to build their own database to resolve it within less time. PDCA( Plan, do check, act) is required before performing any task. Otherwise, it becomes messy and may lead to spending over time than the actual required time. This additional quality is what the employers look while hiring. This helps to build and maintain good work culture. The person with this trait respects other person’s ideas and skills, also they understand their perspective at something, they do not encourage conflicts and clashes with another person who is equally talented. They act matured and self-disciplined to diversify things. They act with patience at times when there are stress and critical situations. They do not try to fight to accept their idea or opinion, they give freedom to others to counter their idea or suggestion. They do not get emotionally detached or frustrated easily. So, employers always choose professionals who can take mature decisions and respect others. A creative person is the most important asset of the company. A boring employee or who do not think out of the box will not be useful for the company’s growth. A team who always look for challenges and works creatively to solve it will be chosen for a great organization. One should utilize the time and money of organization to bring fruitful results to the management. The employers would support such employees and help them to grow in their career since they continuously strive for progress. A mixed combination of intellectualism and expertise will build a strong team and creates a good workforce environment. A person with this ability will be mostly get hired. Many industries would require a person with a pleasing personality to impress their clients with their marketing skills. One need to be warm and cordial enough to get things deal with their clients and customers, poor behavior leads to missing great deals. Especially for marketing field, airlines and customer services would require this personality trait candidate. The clients or customers believes the company by the way the representative express or behave with them. Their confidence and pleasing personality may build a great marketing network and helps to get business. So it is also one of the best personality traits the employers choose while interviewing applicants. Every company has its own mission or vision. Individual should have a great vision to achieve common mission of the organization. They should set themselves some small goals to achieve to the large goal. One who can deeply inculcate themselves with the organization vision, they can work for the success. They build certain values and develop behavior accordingly, they always think in that perspective that would help for future development. They set right path along with the goals of the company. They include themselves into the culture and put all their efforts to attain it. 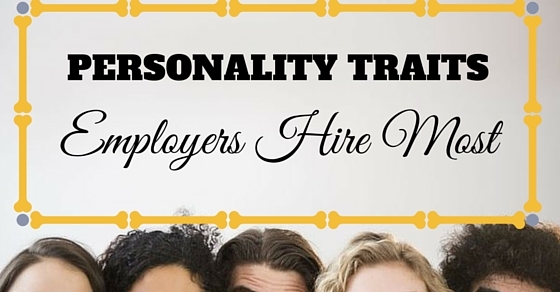 Employers are particular to have candidates with this type of personality traits. One who is healthy can work cheerfully. They are with full of energy to accept any challenges. If they are exhausted to do work and physically unfit they cause disturbance to the work and things get delay due to their absence and company should look for an alternate person to complete the task, which incurs a cost to the company. So employers do check the health of person before hiring them into the company. They should be ready to handle stress at workplace and survive the company with their long service. Also, they would require active members to cheer up the team and motivate themselves to work. To wrap up one should possess all these personality traits to build a healthy relationship with co-workers and management. The above mentioned is a list of employability skills that an employer seeking employees always looks for in a candidate. Culture and behaviour are also important at workplace along with professional qualification and skills.